So the Stylistique girls hit the Visa Swap over the weekend and what utter chaos it was! Got there half an hour after it opened on the first day and almost all the good stuff was gone. Saw some lucky madams walking around with some really nice stuff. Also could not really get into proper rummaging mode as had work in an hour and once i start its hard to stop. Just grabbed anything that looked mildly ok-ish and then decided on whats a keeper in the corner. The fact that there were no mirrors apart from the changing rooms and the queue was never ending didn't help matters. So after getting home from work I tried the stuff on, half of it doesn't even fit! So have a bag full of clothes under the table waiting to be taken to a charity shop again. It wasn't all bad though - managed to pick up a Nicole Farhi black top with studs on the side, a lovely blue & gold chain print vintage scarf, an odd looking red top by a designer I've never heard of but looks amazing with a highwaisted skirt, a grey boyfriend type blazer from Next which looks decent with the sleeves rolled up and a vintage clutch type embroidered bag for a friend who's been looking for one for ages. 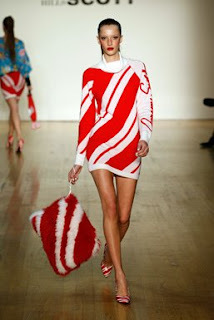 Did also have a slight case of "bargain rage" on the second day with a woman over this Jeremy Scott jumper dress from his 2006 "Food Fight" collection, which I later decided I didn't even like! 1) Head straight for the accessories room first. Thats where all the good (designer) stuff is at! 2) Do keep an eye on the stuff that lands on the floor, most people can't be bothered to pick it up and once in a while you do find a little gem (i.e the Nicole Farhi top). 3) Don't expect to walk out with a whole new wardrobe. I had just under 10,000 points on me card, ended up spending about 2,000 and giving the card away before leaving for work. So next time about 3,000 points will be plenty (at least its all for charity). 4) Go on both days, never know what you might have missed in the mad rash of the first day. 5) And most importantly, get there early. Half an hour later is too late in most cases!